So here’s an awkward question … How many of you are reading this article without ads? Don’t be shy if you are. You’re definitely not alone. You’ll be getting even more ad-blocking options with next week’s launch of iOS 9, which is supposed to support content blocking extensions. That could be a big step forward for the technology, which has been a largely desktop-only phenomenon until now. Naturally, the news has prompted another round of handwringing about the impact that ad blocking could have on the publishing business. 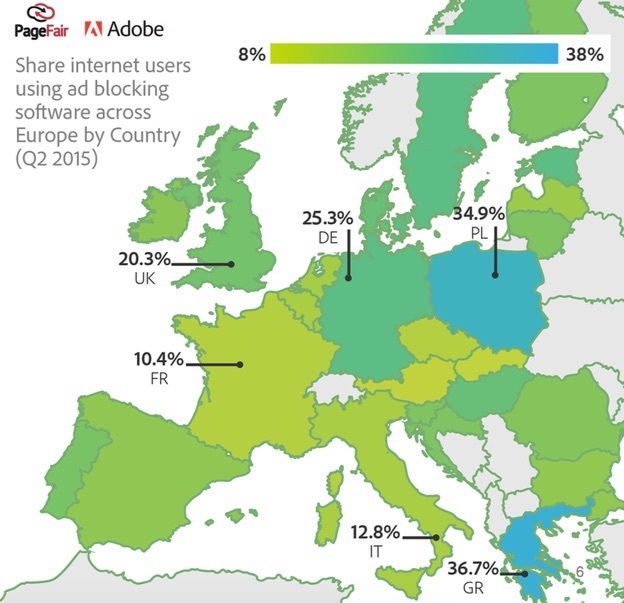 Even without Apple’s support, ad blocking has been on the rise. There are now 198 million global active users of ad blocking software, up 41 percent from 12 months ago, according to a recent report by PageFair and Adobe. The report also estimates that ad blocking will cost publishers $22 billion in revenue this year. Some caveats: PageFair isn’t an objective industry observer, since its business revolves around helping publishers circumvent these blockers. Also, the impact on mobile may be reduced as more content is distributed on apps and social networks. Lastly, there have been arguments that ad blocking won’t hurt publishers as badly as you might think, because the ad business has always been “lossy,” with lots of wasted money, whether you’re talking about TV or print. I’ve been watching the discussion with particular interest and, yes, a little fear, since it’s something that could affect TechCrunch’s bottom line — and with it, my job. So over the past couple of weeks, I’ve been asking people in the media and advertising industry for their perspective. Were they worried? And if so, how are their going to adapt? It’s no surprise that advertisers and publishers who make their money from advertising aren’t exactly fans of blockers. What is surprising is that no one seemed to disagree with the argument that online ads have gotten out of control. Yes, they said, we’ve all seen ads that are too pushy or dramatically increase load times, and yes, they understand why people are unhappy about how their data gets used to target those ads. That was the viewpoint I heard again and again: Yes, there’s a problem, but ad blockers are not the answer. Part of this disagreement boils down to how you view the relationship between publishers and readers. On the one hand, you’ve got publishers saying that there’s an implicit agreement that they’ll give you lots of content for free, but in exchange you have to put up with ads. By using an ad blocker, you’re breaking the agreement. AdBlock Plus, by the way, recently released its own ad-blocking browser for iOS and Android. It’s also working on an extension that will block mobile ads in Safari. But let’s get a little more specific about why people are rejecting online advertising. Naturally, the answer depends on who you ask. PageFair says it surveyed 400 people in the United States and that found the number one reason they use ad blockers, or would use ad blockers, is, “If I feel my personal data is being misused to personalize the ads” (though PageFair also says ad quantity was the most common complaint among millennials). Williams, on the other hand, said the number one reason users cite for installing AdBlock Plus is annoyance with ads (though privacy is also a factor, and he predicted that as ad blocking moves onto mobile, “it will be more about data and speed”). The distinction is important, because different complaints have different solutions. Take Disconnect, which already offers mobile ad blocking software and is working on new tools to take advantage of iOS 9. Since Disconnect is focused on privacy, it doesn’t block all ads, just the ones that are targeted using third-party data. Co-founder and CEO Casey Oppenheim said that if an ad only uses first-party data (i.e., data from the website you’re visiting), then his software won’t interfere. Naturally, not everyone in the ad industry is a fan. The impact of ad blockers differs from publishers to publisher, with gaming sites seeing the largest number of ad-blocked readers. It can also represent a significant amount of traffic for non-gaming sites that cater to young, male, tech-savvy audiences, like TechCrunch. When I asked about how much of our traffic comes from ad blockers, I was told that TechCrunch-owner AOL looked into the issue about a year ago. At the time, it found that ad blockers accounted for 20 to 24 percent of traffic to AOL Tech sites, pretty much in line with other tech-related news sites. On the other hand, a company like Spanfeller Media Group caters primarily to women through its site The Daily Meal, so it’s seeing less than 10 percent of its traffic coming through ad blockers. Even in that case, CEO Jim Spanfeller said ad blocking will become a concern if the trends continue. And while he admitted that he was “pulling a number out of thin air,” he predicted he’d really start to get worried once ad blocking got up to 25 percent. So he’s not just sitting around waiting for that to happen. Spanfeller said he’s already looking at potential workarounds, whether that involves hiding content until people turn off their ad blockers (“But we’ll say it nicer than that”) or asking users to pay if they don’t want to see ads. He acknowledged that those tactics might anger readers — but, well, those are readers he’s not making money from anyway, so he’s not sure they provide much value. “Are people pissed when they walk into a store and they don’t get a car for free?” he asked. Other publishers are already experimenting with different anti ad-blocking tactics. And there are startups like Sourcepoint and the aformentioned PageFair helping publishers to serve ads to users, even if they’ve got an ad-blocker installed. (Williams was particularly opposed to that last approach, describing it as “a short-term decision, an anti-user decision.”) I’m told that AOL is building new tools to track ad blocking and to monetize adblocked pageviews as well. Cunningham said the IAB is also working to make ads better for consumers — he pointed to the organization’s guidelines around HTML5 advertising, which he described as “the beginning of a path” to a better user experience. Kargman and Spanfeller suggested other ways the industry could improve. For his part, Kargman put much of the blame on advertisers’ new obsession with whether an ad actually gets seen. Seems like a valid concern, right? Well, Kargman suggested that as advertisers pushed for improved viewability, they ended up with ads that got flashier and intrusive. So in his view, the industry needs to find better ways (in his parlance, better currency) to evaluate ad effectiveness. Spanfeller, on the other hand, pointed to the proliferation of programmatic ad tech and third-party data. When every ad is supposed to be targeted algorithmically, drawing on different types of user data, you end up with “60 or 70 cookies on every page.” Much of that data, he argued, isn’t really making the ads more effective, so perhaps it’s time to cut back. Will any of these improvements happen? Maybe not, but at least people are making the right gestures. And regardless of how you feel about ad blockers, there’s no denying that they’ve changed the conversation. The challenge will be in finding a middle ground that publishers, advertisers and consumers can live with — and in the meantime, publishers have to survive. That’s something I was particularly curious about in my conversation with Williams: How would he feel if ad blocking ends up killing websites that he admires? Hey, if things do get better, consider turning off that ad blocker, okay? Otherwise I might have to start looking for a real job.